Cancer …there’s hope (8th printing 2004) is the first of three books written by Annette and Richard Bloch. 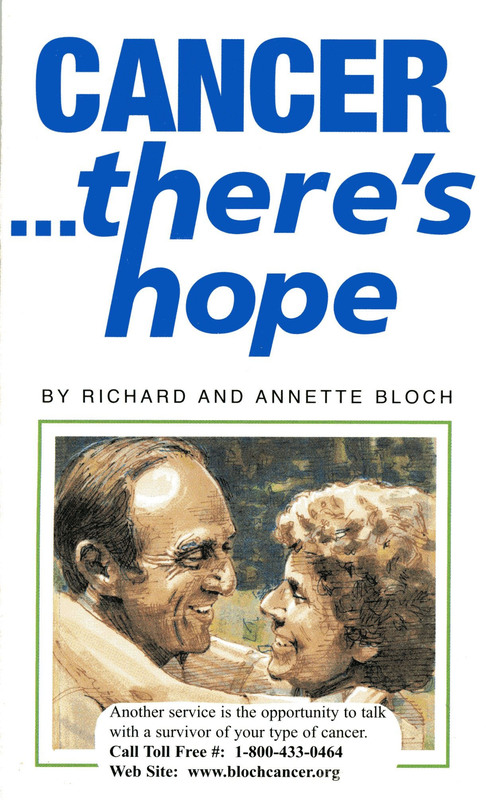 In 1978, Richard Bloch, co-founder and honorary chairman of the board of H&R Block, Inc., was diagnosed with cancer and told he had only a few months to live. 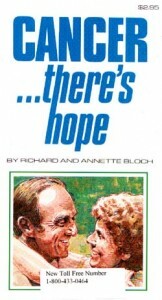 With the help of his wife, Annette, and the doctors who said he could lick the disease, and with a stubborn determination to survive, Bloch waged a bitter, painful, two-year war on the insidious disease. So dramatic was his fight and recovery that Bloch and his wife decided to spend their lives helping to convince others that they too can cope with cancer. The purpose of this book is to advise cancer patients, their relatives and friends what could be involved and what some of their options are. It is also to advise doctors and other professionals what reactions there could be to statements or treatments. The more knowledge we have about this dreaded disease, the better we can help ourselves and others cope.